If the weather turns grey and the torrential rainstorm has poured water on your plans, it is very easy for your mind to go completely blank. Are you still on the hunt for the perfect boredom-busting activities for children? Chin up! 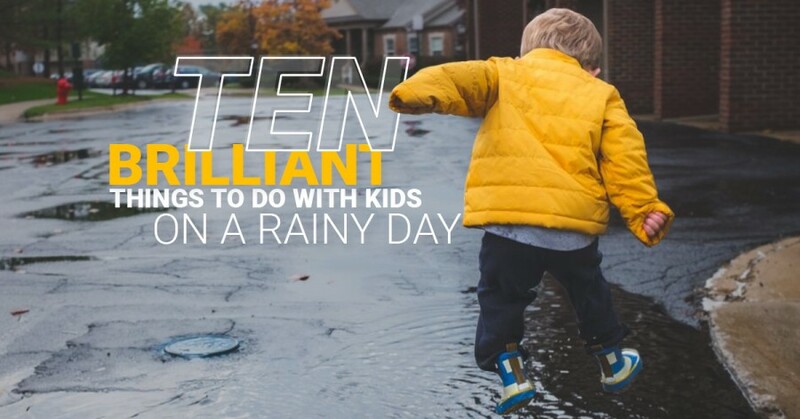 You are in safe hands now: luckily, TickiKids are experts at presenting a “Plan B”, revealing plenty of brilliant things to do with kids on a rainy day. We’ve put together ten of our favourite video tutorials. This lifesaver will be of interest to all parents who want to have some fun family time in a comfort of their homes, using easily available materials. It’s always good to give children a bit of science, so make the most of a rainy day to undertake one of the most spectacular experiments like real scientists right at home. fizzing antacid tablets (such as Alka Seltzer). If science experiments are not your child’s thing, maybe some craft activities will be more up your street. Whether it is a Christmas card or Birthday card, the craft is a tonic in itself that helps flex children's creative muscles. After all, is there anything more pleasurable than enjoying the process of creating unique personalised cards for your dearest ones? Frustratingly, when the sun stubbornly refuses to pop back out, it’s quite challenging to keep little ones interested inside the house. Never fear: try your hand at this fun obstacle course and your family won’t go short of indoor activities. Feeling crafty? Ever imagined what it might be like to create a keepsake for your family for decades to come? For this, we have an adorable craft idea: salt dough will certainly become a fabulous DIY Christmas decoration quick and easy to make with kids at home. Super sleuth children will put their detective skills to the test to solve a crime. From dusting kit for fingerprints to a black light reader, these crook-catching activities for kids will feed their imagination. Does your child try to avoid the bath? This special recipe for homemade bath paints is an inventive way to make your little one just keen on bath times. After all, what’s better than taking a bath on a rainy day? Getting clean and painting with the baby is the perfect combination. This tutorial about a DIY dollhouse is a perfect lifesaver for parents who have daughters. First up, your little princess's creative juices will start flowing when it comes to the handcrafted decors of a room. Secondly, such an activity will help keep your kids entertained for hours. Dreaming of the best snowball fight ever? Make your own snowballs from dollar store toys and enjoy your family get-togethers all the year round. Cheerful screams guaranteed! Escape the rain by gardening with kids at home. Children of all ages love watching how plants grow from tiny seeds just in front of their eyes. It is a perfect way of getting kids involved in the garden. Why not try annual ryegrass or herbs? Watch this video tutorial and have a magical day with legendary English chef Jamie Oliver and his lovely kids cooking cheats pizza that your kiddies will love to make and eat with you. Bon appetit! There are still numerous options to do indoor thanks to an array of playgrounds in Hong Kong to help keep your children entertained while the sky turns grey. We would love to hear all your favourite indoor & rainy day activities in the comments box below.